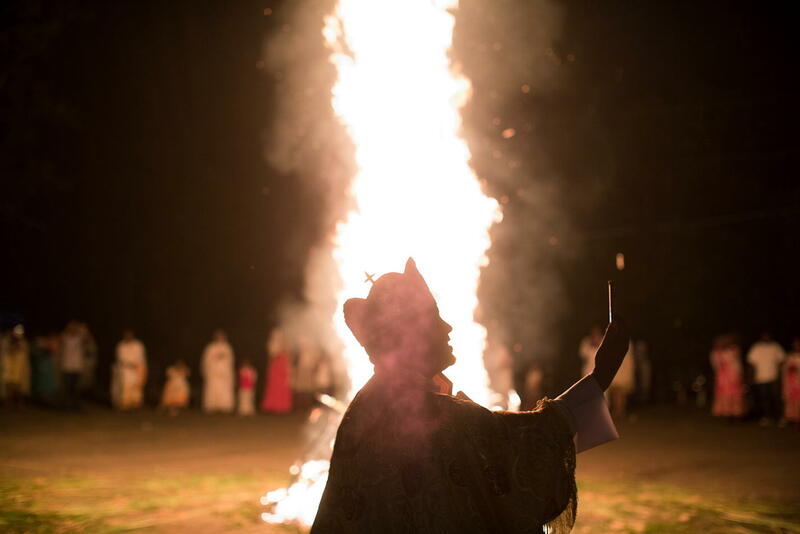 An officiate of the Ethiopian Orthodox Church stands before the blazing Demera, lit to commemorate the prophetic dream of Queen Eleni (or St. Helena, c. 246–330 CE), mother of Emperor Constantine. Late classical and medieval histories, hagiographies, sermons, and artworks portray Eleni as the discoverer of the True Cross and the destroyer of pagan temples. Ethiopian Orthodox tradition holds that the location of the cross was revealed to Eleni by way of a dream instructing her to build a fire and follow the smoke to the site of the buried crucifix. 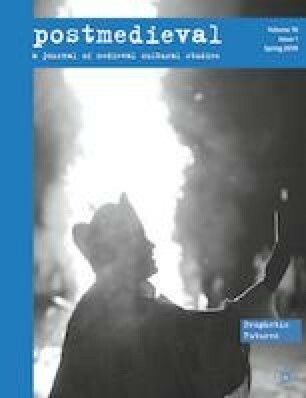 The Demera re-enacts Eleni’s fire during the celebration of Meskel, in which the collapse of the pyre is sometimes read as ‘indicat[ing] the course of future events’ (Ullendorff, 1968, 114). The present-day ritual thus reanimates a past in which the future was revealed—perhaps a future that contained the present conflagration, but certainly a past said to be built atop other houses of worship consigned to a different, irretrievable history. While the historic location of the Demera is Meskel Square in Addis Ababa, Lauren Pond’s photograph was taken in Columbus, Ohio and is one of many images in her ongoing photographic essay, ‘Religion in the Midwest.’ Her work witnesses the variety of faith traditions animating a region often considered synonymous with homogeneity; it documents spiritual communities ranging from a ‘cowboy church’ to an Islamic cultural center to a pagan prison ministry. The congregation pictured in our cover image is only one of several Ethiopian Orthodox churches in Columbus. Pond approaches many of her subjects as an intimate, with the aim of establishing a longstanding personal relationship with the people she photographs. This is especially true of her portraits of Pentecostal serpent-handlers, which, with her other work, is viewable on her website (https://www.laurenpondphoto.com).